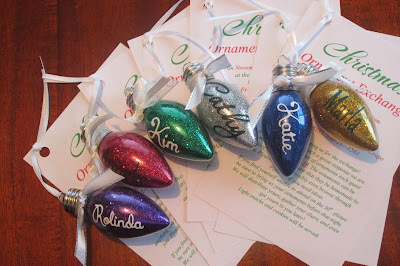 I made the glitter ornaments, using the instructions you can find, well basically everywhere you look on Pinterest or you-Tube. 1.Take a little bit of floor wax, like Pledge Floor Multi-surface or Mop and Glo, swirl a small bit around in the glass ornament, draining out the excess. 2. Then use a funnel to add some extra fine glitter. It miraculously sticks to the inside of the glass! 3. Shake out excess glitter. 4. Allow them to dry upside down for a little while. I then embellished with some ribbon, some vinyl and of course the invite itself. I'm getting excited! 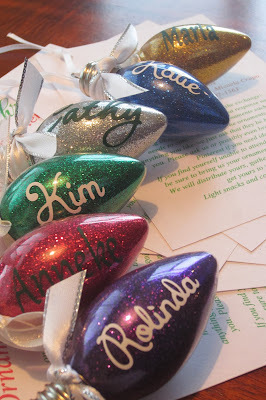 Click HERE for some more info and tips on how to host your own ornament exchange party! How did you put the name on? I have a vinyl cutter (similar to a Cricuit) so I cut and applied the vinyl, however I have seen people buy stickers too.